Our friends at Copenhagenize Design Co. have launched their 2013 Copenhagenize Index, where they painstakingly combed through data for 150 cities to come up with their 2013 index of top bicycle friendly cities in the world. Amsterdam tops the list once again, with Copenhagen trailing behind at a close second, while Canada’s only city, Montreal, ties Munich and Nagoya for 11th place. Business Insider simultaneously published the Copenhagenize Index earlier today, and the article has already received more than 118,000 views. You may recall the Copenhagenize Index spawned from a conversation I had with Mikael Colville-Andersen in 2010, whereby I had submitted the first revision of the ranking criteria. The Copehagenize team has worked tremendously hard to finalize the 2013 index, with the help of over 400 volunteers from around the world, who contributed to providing the data. 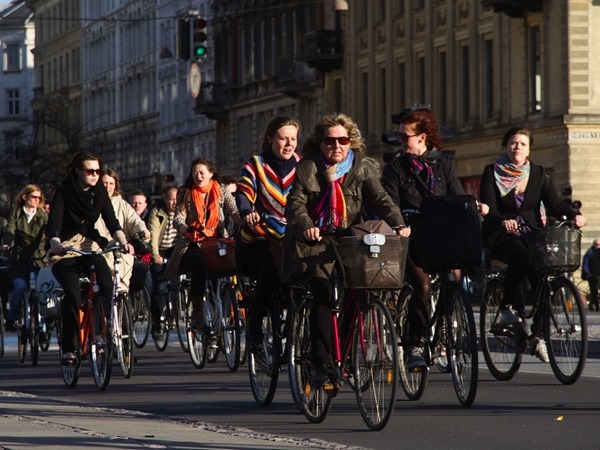 People on bicycles in Copenhagen – Photo courtesy of Copenhagenize Design Co. The 2013 Index has taken a lot longer than we expected. We ranked 80 cities in 2011 and increased that to 150 this time round. Although this time round we had the help of over 400 individuals on every continent – our eyes and ears (were) on the ground – to assist with the ranking. While a mammoth task done con amore, it was just as interesting and rewarding as in 2011. While we would have liked to have ranked every single city on the planet, we kept it to a rough population size and included some cities because of their importance in their nation. 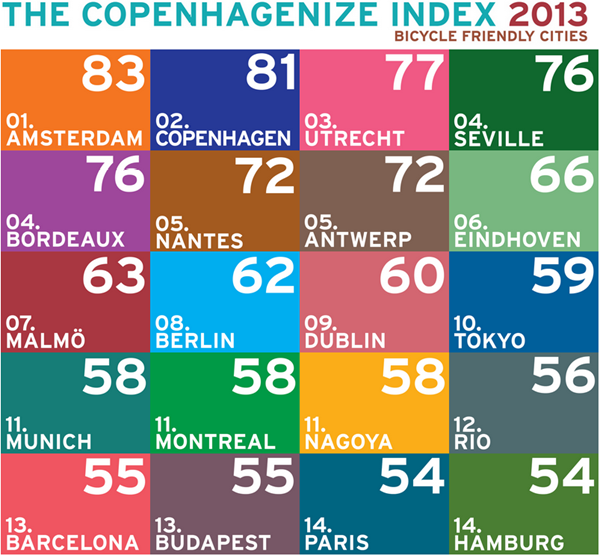 To view the full results, visit the Copenhagenize Index 2013 website.